Safe residential asbestos removal | Qualitas Builders | New builds & renovations in Auckland | Quality you deserve! If you’re planning a major renovation or doing some DIY around your home, keep safe by checking for asbestos. If your home was built before 2000, and especially those built or renovated between 1940 and the mid 1980’s, then it's likely to contain some form of asbestos. You may even find asbestos or asbestos-containing materials (ACMs) in more recent buildings. For more information, see Worksafe New Zealand's excellent fact sheet for homeowners. If asbestos is encapsulated and undisturbed, it’s considered safe. However, if it has deteriorated or is disturbed during renovations, you could be putting yourself and your family at risk. This is because loose asbestos fibres can be breathed in and lodge in your lungs. This can cause lung cancer, asbestosis and other serious lung diseases. We recommend having an expert check the areas you’re working on. If necessary, make sure to have a sample analysed before you start work. Don’t take risks with asbestos. If you’re unsure if materials in your home contain asbestos, get professional advice. 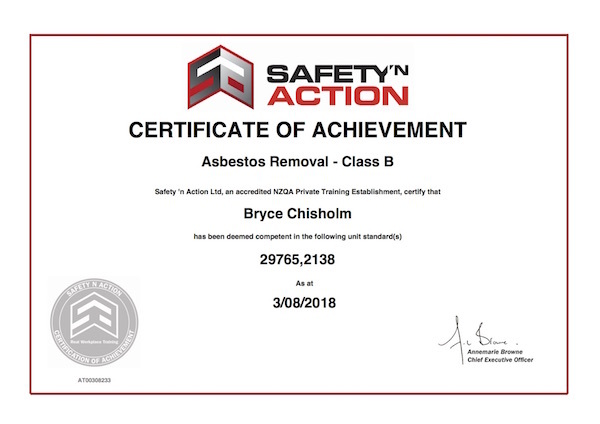 Bryce holds a Class B licence for asbestos removal. Qualitas Builders can assist with identification of asbestos and, if detected, facilitating its safe removal from your home.